Once you’ve uploaded your digital photographs to your computer, a time will come when you’ll want to either share them or save backup copies. Burning photos to a CD or DVD in Windows Vista is one of the easiest ways to do either. Insert a writable CD or DVD into your disc drive. Open your Photo Gallery and select a photo you want to burn. If there’s only one image you need to burn, locate it with the Navigation pane and then click the thumbnail to select it. You don’t need to display the figure; just select the thumbnail. To select multiple images, hold Ctrl while clicking additional images in the Photo Gallery. Click the Burn button and then choose Data Disc. Obviously, if you’re burning the photo to a DVD you can choose DVD instead. In the resulting Burn a Disc dialog box, enter a disc title and select whether you want to use the Mastered format or the Live File System. Click Next when you’re finished. The Master file system is the most widely accessible format; however, using the Master format means that a RW disc will essentially be turned into a single-use disc. If you’re going to want to use this disc over and over again, be sure to choose Live File System, which causes your computer to treat the disc as if it was just another hard drive. With the Live File System, you can simply drag files to the disc just as you would with a Flash drive. 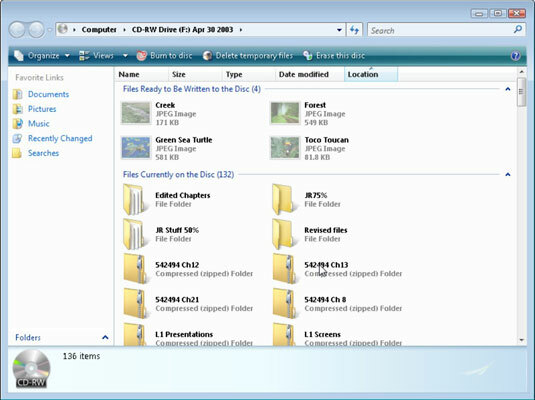 Review the files that have been selected in the Windows Explorer window that opens. 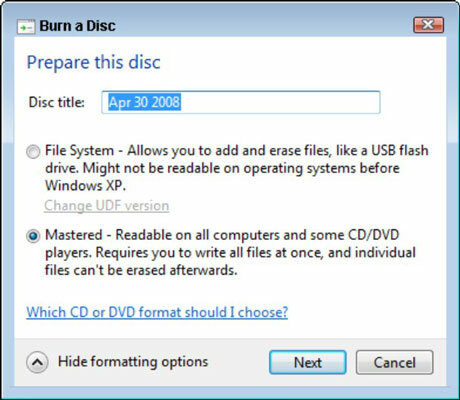 When you’re satisfied, click the Burn to Disc button to proceed. If you’re using the Mastered format, be sure that you’ve selected every image you’re going to want to copy to the disc. Go back to the Photo Gallery if needed at this point. Windows Vista will continue collecting the image files in this location until you’re ready to burn them to the disc. In the Burn to Disc window, make any changes you wish to the recording speed or disc name, and click Next. A progress bar appears. When the files have been burned to the disc, a confirming dialog box appears, and your disc drawer opens. If you want to make more than one copy of the selected files, select the Yes, Burn These Files to Another Disc check box at the confirmation dialog box that appears. Click Finish to complete the process and close the wizard. You should be able to read the image files off the new CD or DVD.